Three-quarter view of my Speed 400 powered PuddleMaster. 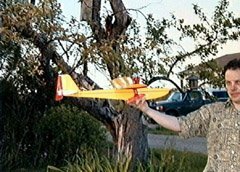 I recently went to a conference which was being held at a lakeside resort and I just had to have a sea plane to play with during breaks. I phoned around to try and find an Ace PuddleMaster kit, but no one had one in stock, and due to the recent purchase of Ace by Thunder Tiger, no one was able to tell me when they might get one. With only three weeks to go before the conference, one of my flying buddies gave his set of plans for the PuddleMaster. 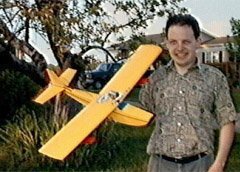 Since for some unknown reason Ace made these 3/4 actual size, I decided to build the plane to that size, and power it with a Speed 400 instead of an 05-sized motor. To simplify construction, I decided to use an Ace constant-chord foam wing that I happened to have on hand. This has a drastically different airfoil than the PuddleMaster‘s, but I figured it would work okay. I also used solid sheet for the vertical and horizontal stab (1/8" contest grade balsa), made the formers out of 3/32" x 1/2" strip, and made the tip floats out of off-cuts from a retired Ace foam wing. 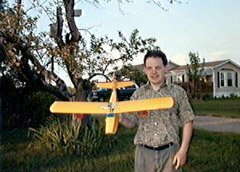 The following photos show the finished plane. Click on a photo to see it full-sized. 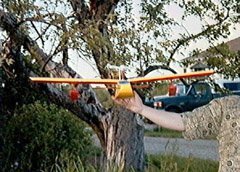 The plane is covered in opaque yellow and transparent red Solarfilm, because those are the colours I happened to have on hand. I sealed the balsa along each edge and each joint with Sig Stix-It to make waterproof seams. The PuddleMaster on its way into the reeds. The first flight attempts were rather disastrous. 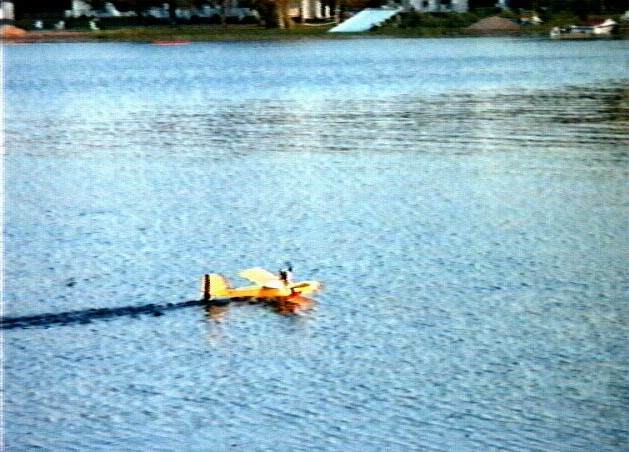 The first attempt resulted in an aborted takeoff in the reeds. My retrieval volunteer broke off the tail (through no fault of his own; it was caught in the reeds, and the glue joint was not strong enough). It looked great until it got caught up. So, I dried everything off, repaired the tail, and decided to try again the next day. This time, I stayed well away from the reeds. I started a takeoff run, got up to speed, the plane lifted off, and promptly stalled. One of the tip floats broke during this manuever. I removed the tip floats, and decided to try a hand launch. The plane was really squirrely. The ESC got wet, and that was the end of that for the day. The water rudder also broke, so I just cut it off and sealed the wound with CA. I spent the rest of the day convinced that it was just pilot technique causing my grief. One of my friends suggested that perhaps it was the c.g., and later I began to consider that maybe it was. I did some quick calculations, and decided the c.g. was way too far back. It was at about 38%. I rearranged the interior a bit to get it further forward, and ended up taping a $1 coin to the front deck to get it forward to the 30% mark. 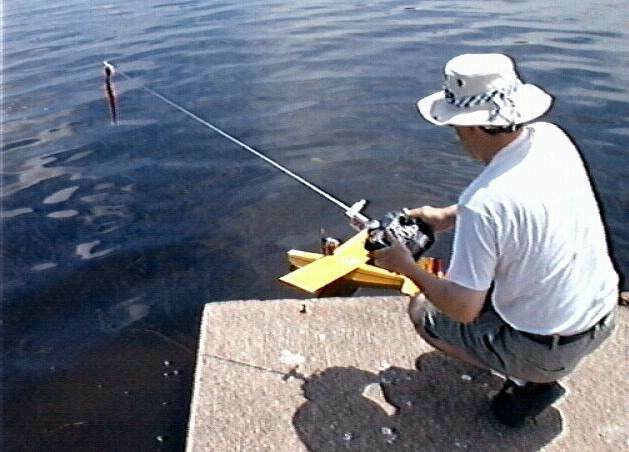 Preparing for the first successful water take-off. The next day, I tried again, with a hand launch. The plane flew straight out, dipped a bit, built up speed, and became airborne. I flew it around for about 3 minutes and made a less-than-elegant landing. I put in another battery, and flew it again. This time, I made a very nice landing (watering?). The plane sort of skimmed along the water for quite a ways before settling in. Very pretty. Then, I decided to try a water takeoff. A friend held the plane level for me while I went to full throttle. The plane took off across the water. 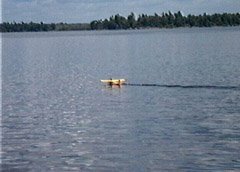 It was a bit skittish with no tip floats, and no water rudder, but it got off okay. I flew around for a few minutes, and made another even nicer landing (I guess technically, it wasn’t nice, because it bounced a long way across the water). I got a round of applause from the on-lookers (my co-workers). On the step and accelerating. I then went and charged my batteries to try again. I did a hand launch again, and the flight was kind of marginal and squirrely. I tried another water takeoff, and a wing tip dug in. So I tried another hand-launch. The plane went straight for about five feet, and then nosed into the water at full power, so that was that for the day. I noticed that the c.g. had moved back to about 35% or so, probably due to water soaking into the tail. I dried everything off overnight, and tried again the next morning. Same nose-in syndrome. It was time to pack up and go home, so that was my last attempt. When I got home, I noticed that the elevator servo had come unmounted. The elevator control horn is on top, so throwing the plane would cause the servo to move back, and thus apply down-elevator. Hence the nose-in problem. The c.g. on the PuddleMaster plans is way too far back, no matter how you look at it. I can’t imagine that the original PM would be stable that way. Epoxy is not a good adhesive for balsa that will get wet. It doesn’t penetrate far enough, so the outer layer of wood just lets go. 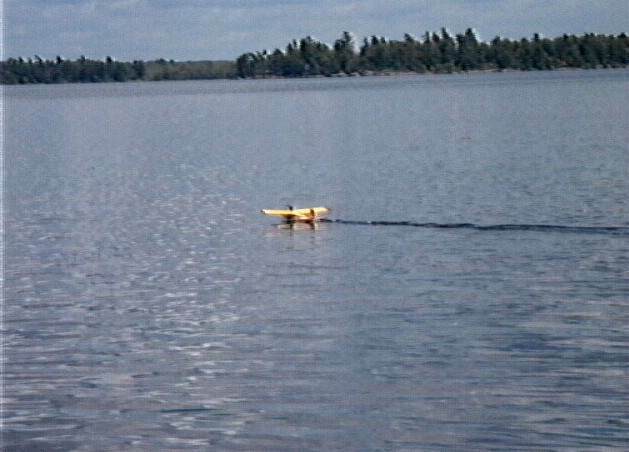 Servo tape is not good for sea planes. 24oz is about the limit of what a Speed 400 will fly. Performance was adequate, but that’s about it. 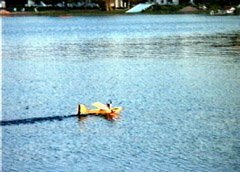 On the other hand, watching the full-scale Piper Cub on floats that was there, the PuddleMaster definitely outperformed it. Power off, this plane drops like a rock. I’m going to have to learn to do power-on landings, or at least avoid the temptation to slow the plane down too much when doing an approach. Micro servos. That’ll shave two ounces off the weight. Move servos and receiver forward. That’ll shave the weight of the $1 coin off the weight. Lightening holes in the tail, but that’ll probably only save a gram, so it might not be worth it. 500AR instead of 600AA batteries? That’ll save another ounce. Or, 600AEs would save 1 1/4 ounces. Reinforce the floats with some light glass cloth and polyurethane. 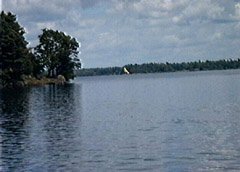 A note on the quality of the photos: These were taken in 1998 with a very early non-digital electronic camera that stored images on a 2-inch floppy disk in NTSC video format. Transferring the pictures to the computer involved the use of a video capture card, so these pictures don’t look any better than frames captured from an analog camcorder. Very intersting plane. I have one I am building and adding an AP Wasp .051 motor. Need that throttle. Anyway this is a great 1/2A plane, just right to learn the water planes takeoffs and to get into water type planes. 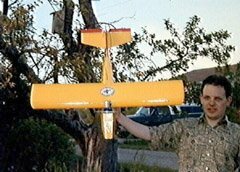 I bought an ARF-stage PuddleMaster from a fellow a couple of years ago and outfitted it with a Nippy Black 1608/160, a 6.5X4 prop, and 1200 3-cell lipoly. All-up weight comes in at 31 oz. It’s a happy water plane! Nothing overpowered, mind you, but a pleasure to do splash and goes with to your heart’s content! When I build my own (I got one of the Pondside kits), I will do a better job of waterproofing, go with lighter servo/control rods, and allow the battery to pass ahead of the forward bulkhead. Glad to hear you’ve finished it! 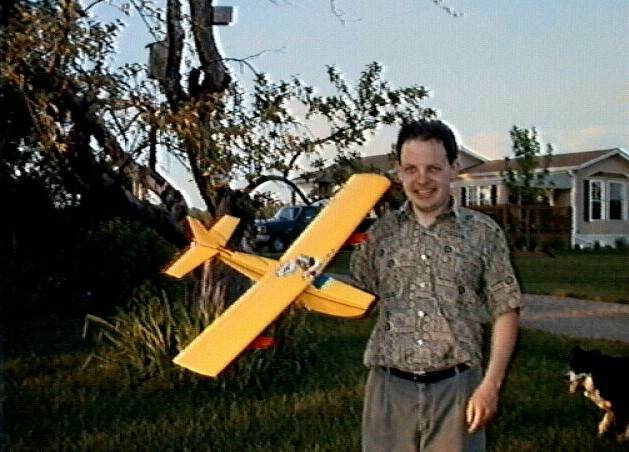 I found I could loop my PuddleMaster with a bit of a dive first, but maybe the extra wing area (and lower weight?) of yours results in too much drag and not enough momentum to carry it through.